"A computer benchmarking tool to measure the graphical performance of your PC." A computer benchmarking tool, 3DMark is created and developed by the Futuremark Corporation to help determine the performance of a computer GPU by specifically testing the 3D graphic rendering performance and CPU processing capabilities. 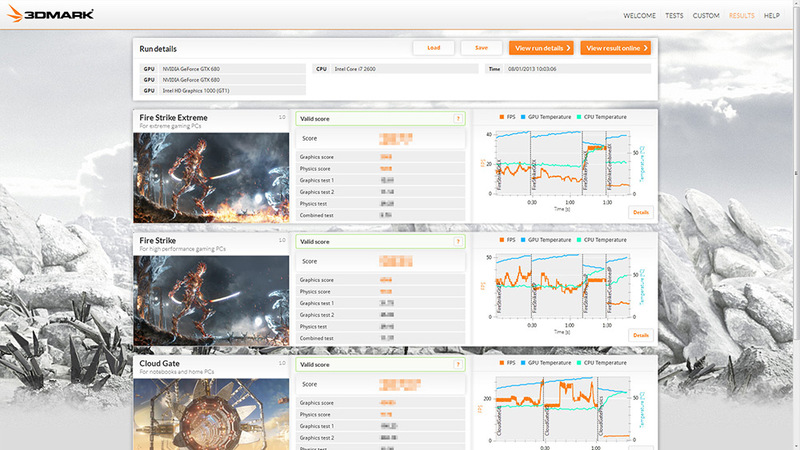 If you have used any of Futuremark's benchmarking software in the past, you'll be quite familiar with this new version of the 3DMark benchmarking tool. As with all of the software Futuremark has made in the past, the software puts your computer through a series of stress tests to test the performance of a specific type of important performance on your PC. When the test is completed, the software gives you a score based on the performance of your PC. The higher, the better. The measured units used by the software is intended to give a normalized mean for comparing different PC hardware configurations based off of the performance of the graphic processing units (GPU) and central processing units (CPU) which is, in general, seen by gamers and overclocking enthusiasts as a big factor in the way of performance for video gaming performance. This is the newest version of 3DMark, but there have been many version before it. Futuremark has been developing updated releases of 3DMark since it's original version back in 1998. Each 3DMark that has been released has been based on a specific version of the DirectX API. This means that scores that you get for performance benchmarks cannot be released to scores from other versions of the software. Unlike older versions, this version features many different types of tests to test different types of 3D performance on the PC you are running 3DMark on.